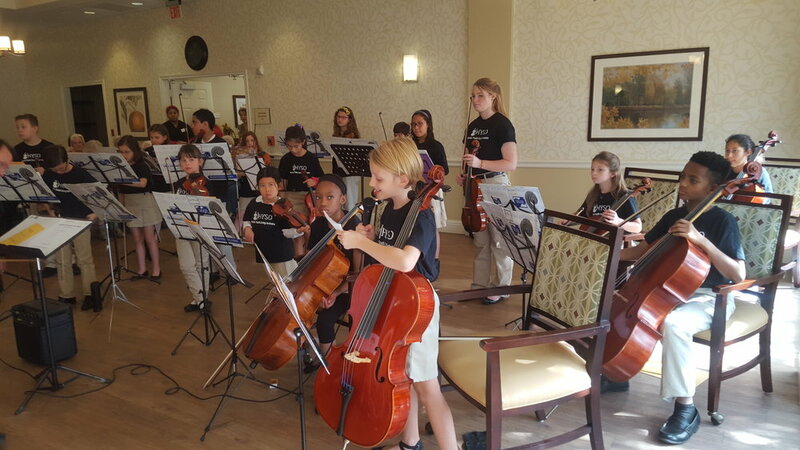 The Houston Youth String Orchestra is excited to continue it’s journey in it’s second season as the string orchestra of Houston for youth of all ages (5 years old and above on violin, viola, cello, double bass). We are now offering our beginning orchestra (Concert Orchestra) program as well as an intermediate/advanced string orchestra program (Philharmonic Orchestra). The HYSO program provides students from kindergarten and beyond, an unparalleled music experience. Masterclasses and sectionals occur regularly with musicians from The Houston Symphony, Houston Ballet, and Houston Grand Opera orchestras. Students are exposed to orchestra literature at the earliest of ages and are able to grow through a comprehensive program. 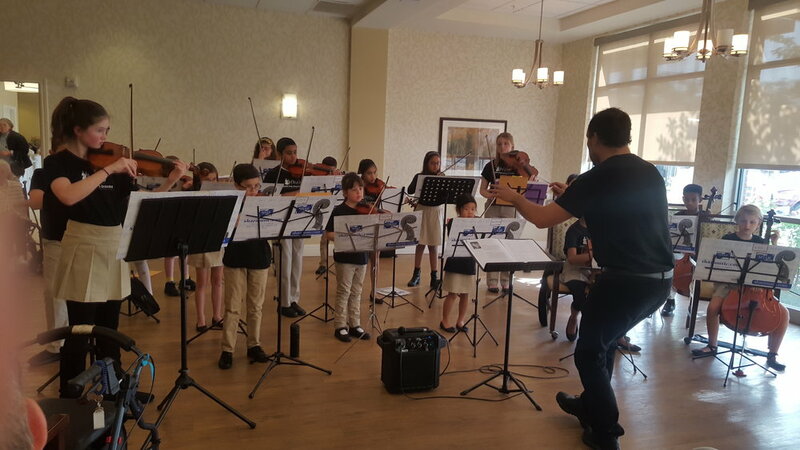 In addition to community outreach performances, students are given the opportunity to perform formal concerts twice per year under the direction of Houston Symphony violinist, Kurt Johnson. All students have the opportunity to strengthen their listening, ensemble, and music theory skills during rehearsals. Under the direction of Quan Jiang, the HYSO beginning orchestra (Concert Orchestra) is an entry-level orchestra for students with minimal orchestra ensemble experience and a Suzuki book level 2 and above. The basics of reading music and playing in an ensemble setting are explored in this orchestra. A maximum of 20 students will be admitted to this ensemble each season. Under the direction of Kurt Johnson, the intermediate/advanced orchestra (Philharmonic Orchestra) is for students with orchestra ensemble experience and/or at a Suzuki book level 3 and above. Students in the Philharmonic Orchestra, develop a deeper understanding of listening skills, blending of sound/colors, and dynamics among other skills. Students study advanced repertoire as well. 12-15 students are admitted into the Philharmonic Orchestra to facilitate a closer teacher and student relationship. Conductor, Kurt Johnson, stresses concepts such as recognition of pitch, rhythmic accuracy, and ensemble skills. Auditions are required for participation in the Philharmonic Orchestra only. Concert Orchestra entrance is based strictly on a music teacher’s letter of recommendation and date of student’s application. $30 non-refundable application fee is required of all applicants. Acceptance of a position in the orchestra requires a $200 non-refundable deposit. Philharmonic Orchestra: 3 scales with 2 octaves ascending and descending, 1st and 3rd position, use of vibrato if possible , Suzuki Book 3 or higher, full-clear tone. Thank you to all that applied for the 2018-2019 season! We were thrilled to see so much interest in the HYSO program! Our 2019-2020 season applications are now available! Please review all details below. Application and $30 non-refundable application fee are due April 15, 2019. If an applicant needs to reschedule their audition date or time, an additional $30 non-refundable fee is required after 48 hours of receiving their initial audition confirmation. Once a student has submit their application and fee, they will be informed of their specific audition time based upon their preferred audition date. Any specific time requests will be honored to the best of our ability. Apply early since auditions will be assigned on a first come, first serve basis. Audition dates are Saturday, April 27, 2019 and Saturday, May 4, 2019 from 2-6pm at the Houston Youth String Orchestra administrative office; 1011 Heights Blvd. Houston, TX 77008. If a student would like to be considered for the Philharmonic Orchestra and Concert Orchestra, please submit a private music lesson teacher letter of recommendation in addition to the application. Only one application fee and application is necessary to be considered for both orchestras. An applicant who is solely interested in participation in the Philharmonic Orchestra, does not need to submit a letter of recommendation. 12-15 positions will be available with the Philharmonic Orchestra for the 2019-2020 season. Once all positions have been filled, we will keep a waitlist on file. All Philharmonic positions will be filled based upon audition. Students will be notified of results no later than May 25, 2019. Please contact the HYSO office at 713-423-5073 if you do not receive results by this date. If you have questions, please contact the friendly HYSO staff at 713-423-5073 or use our contact form below. Application, $30 non-refundable application fee, and private music lesson teacher letter of recommendation deadline is April 15, 2019. 20 positions will be available with the Concert Orchestra for the 2019-2020 season. Once all positions have been filled, we will keep a waitlist on file. The applicant selection committee plans to accept students based upon date of application (first come first serve) and letter of recommendation. Students will be notified shortly thereafter. If you do not receive any information by May 25, 2019, please contact the HYSO office at 713-423-5073. Grade level in academic year 2019–2020. For which orchestra level are you applying? How did you learn about HYSO? $200 non-refundable deposit, payable online, is due no later than 10 days after letter of notification is e-mailed to all accepted applicants for the 2019-2020 season. This deposit will be applied to the remaining balance of dues. Remaining 2019-2020 season payments are due in full by June 20, 2019. $500-Concert Orchestra and $600-Philharmonic Orchestra respectively. Kurt Johnson has been a member of The Houston Symphony first violin section since 2001. He received his master's degree in violin performance from Northwestern University and his bachelor's degree from Oberlin Conservatory. Mr. Johnson studied violin with Gerardo Ribeiro, Marilyn McDonald, David Taylor, Almita and Roland Vamos, as well as soloist Rachel Barton. While attending Northwestern, he was concertmaster of the Northwestern Symphony Orchestra and the Civic Orchestra of Chicago. He was also a member of The Grant Park Symphony in Chicago. As a youth he was a winner of the Chicago Youth Symphony Orchestra's concerto competition. Mr. Johnson is also a baroque violinist. He performs regularly with The Ars Lyrica Ensemble in Houston and Camerata Ventepane in Mexico. In addition to playing the violin he is also an amateur trumpet player and proud father to his daughter, Allegra and son, Luke. Quan Jiang is excited to join The Houston Youth String Orchestra as it's new associate conductor and leader of The Concert Orchestra. Mr. Jiang served as Assistant Concertmaster of The San Antonio Symphony for three years. He spent six seasons as a member of the first violin section of The Houston Symphony. For the past eight years he has been the concertmaster of The Cypress Philharmonic. He has been a faculty member of The Virtuosi Chamber Orchestra and is in high demand as a coach for various region orchestras throughout the greater Houston area. As a soloist, Mr. Jiang has been a top prize winner of The Enrico Fermi Violin Competition and The Fishoff Chamber Music Competition. He has been a soloist with The San Antonio Symphony, The Adelfi Chamber Orchestra, The New York Pro Arte Chamber Orchestra, The Manchester Chamber Orchestra, The Manhattan Symphony and The Central Conservatory Orchestra (Beijing). Mr. Jiang's chamber music credits include: original member of the Grammy winning Camerata San Antonio, The Gotham Quartet (graduate quartet residency at Rice university), The Jiang Duo and Equinox Quartet which exclusively recorded for the Eroica label.